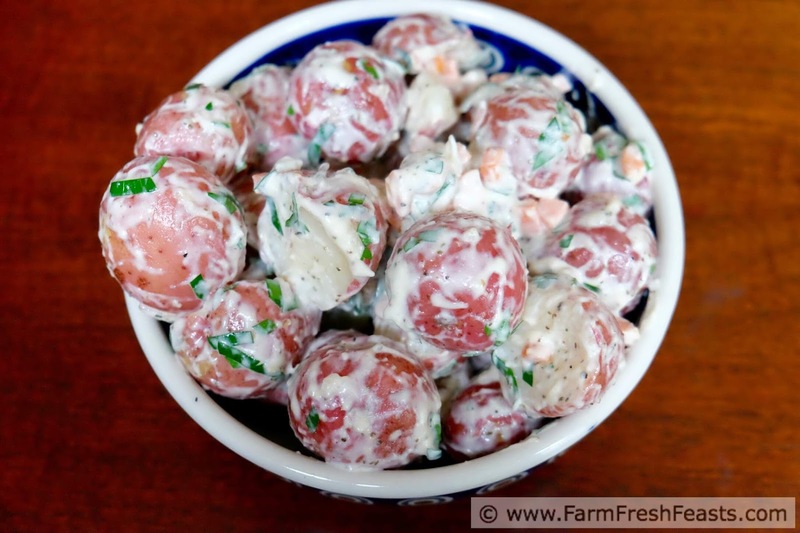 A recipe for new potatoes bathed in a chive blossom vinegar-mayo dressing and accented with carrots and parsley. 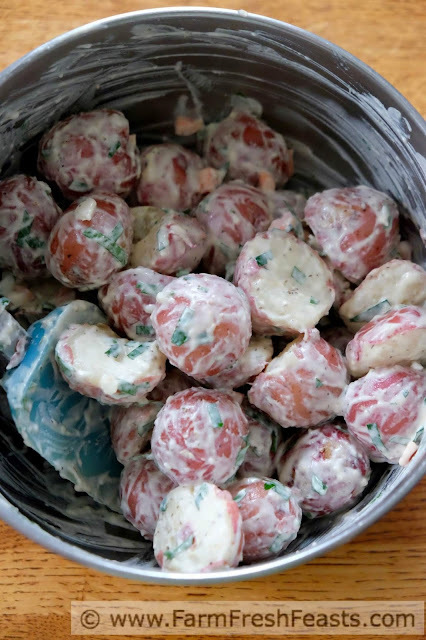 I've got a terrific potato salad today that celebrates the fresh flavors of the season. 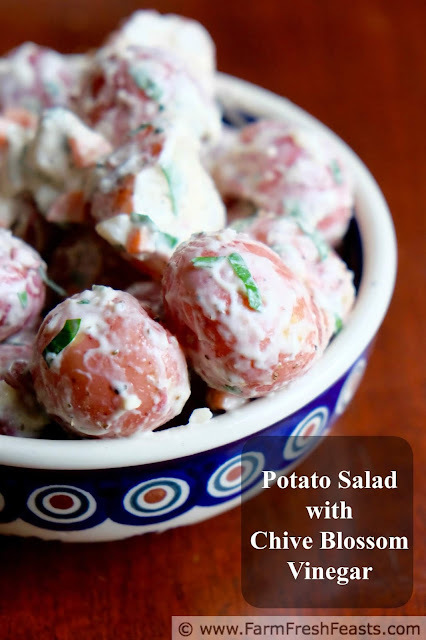 This perfect picnic side dish has the mild flavor of chive blossom vinegar paired with tender new potatoes. It's a great accompaniment to a cook out, graduation party, Father's day, or just because it's lovely weather outside. If you grow chives (simple--it's a perennial clump that you plant once and harvest for years) you'll have chive blossoms. Just like with my beloved garlic scapes, the blossoms are an edible plant part that's often overlooked. 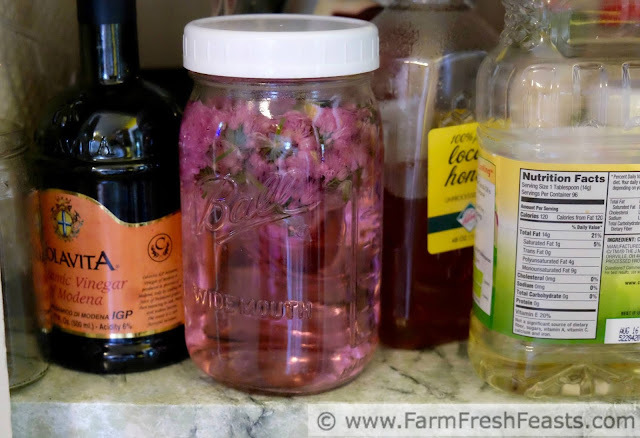 I've already shared a few recipes using them (Chive Blossom Focaccia and Chive Blossom Potato & Egg Salad) but if you've got plenty, please make Chive Blossom Vinegar. It's got a great flavor and really adds to your dishes. Do you have a vinegar hoarding problem, too? I've already got a bunch of vinegars in my pantry--rice wine, apple cider, balsamic, red wine--and white in the basement for laundry/pickling. Why make another one? Because it's easy, and it's fun. If you had access to enough chive blossoms (anyone want to give me some?) this would make a lovely gift. I was sad last year when the last of my vinegar was used up--mostly in potato salads--and will be glad when this year's batch has finished steeping. Potatoes in so many forms are a staple for my family. In the Fall we got a large volume of them from our Community Supported Agriculture (CSA) farm share and I stored them in the basement. We've got a dry basement, and they lasted in baskets for a few months. So many dinners started with roasted potatoes, and of course on Thanksgiving I made my Make Ahead Irish Mashed Potato Casserole. In the summer I switch to potato salads. 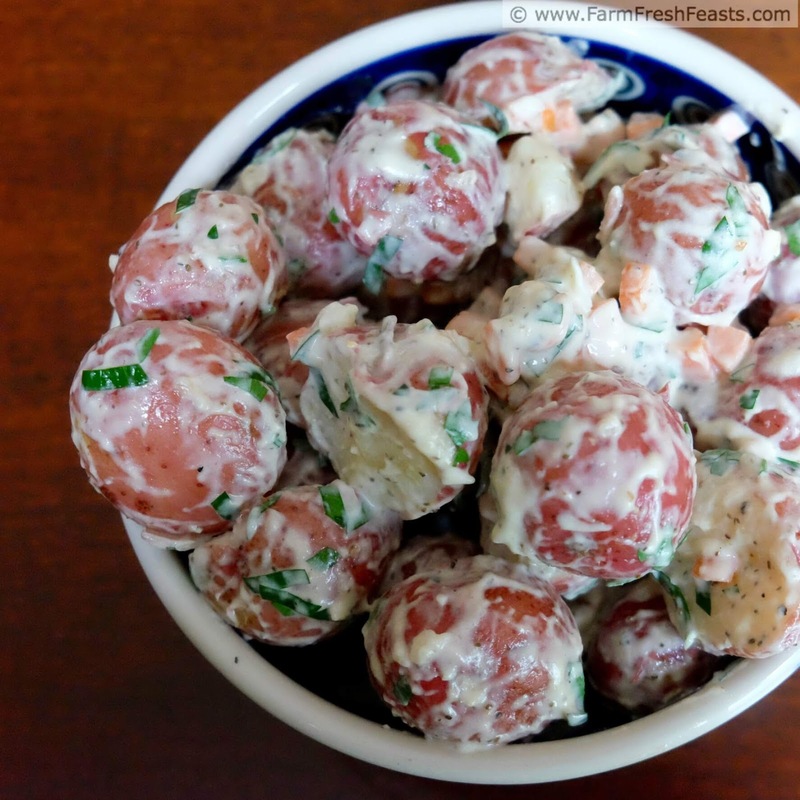 My Confetti Potato Salad is the old family standby, but lately I've been using the chive blossom vinegar with it. This time I wanted to play up the colors of the new red potatoes so I grabbed some parsley (planted next to my chives) and my mother's day present herb scissors (Amazon affiliate link) and went to town. 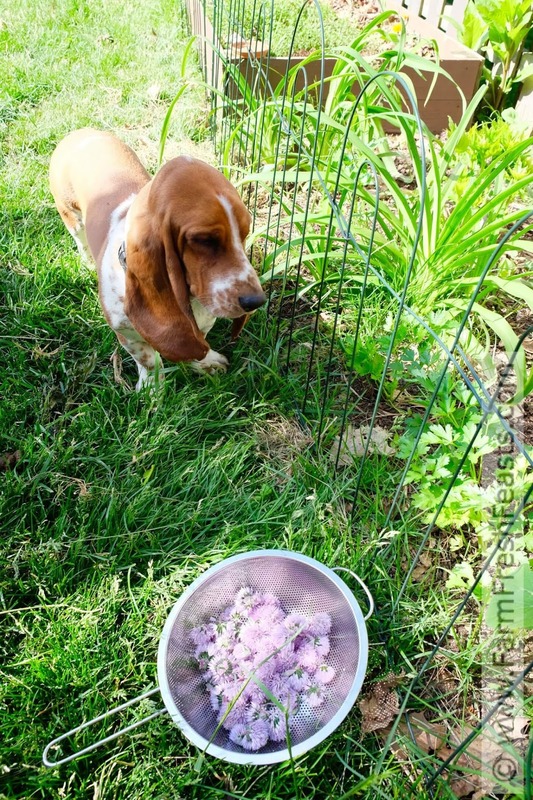 Robert Barker considers the backyard his own Edible Foodscape. For more recipes using herbs, please see my Recipes Using Herbs Collection. Innovative titles are not my strong suit. For more recipes using potatoes, please see my Potato Recipes Collection. These collections are part of the Visual Recipe Index by Ingredient, a resource for folks like me eating from the farm share, the farmer's market, the garden, the neighbor's garden, and great deals on ugly produce at the grocery store. In a large (at least 3 quart) saucepan, bring water + a healthy pinch of salt to a boil over medium high heat. Add in potatoes, cover, reduce heat to medium and simmer for 10 minutes until potatoes are just tender when pierced with a fork. Drain and return to the saucepan. 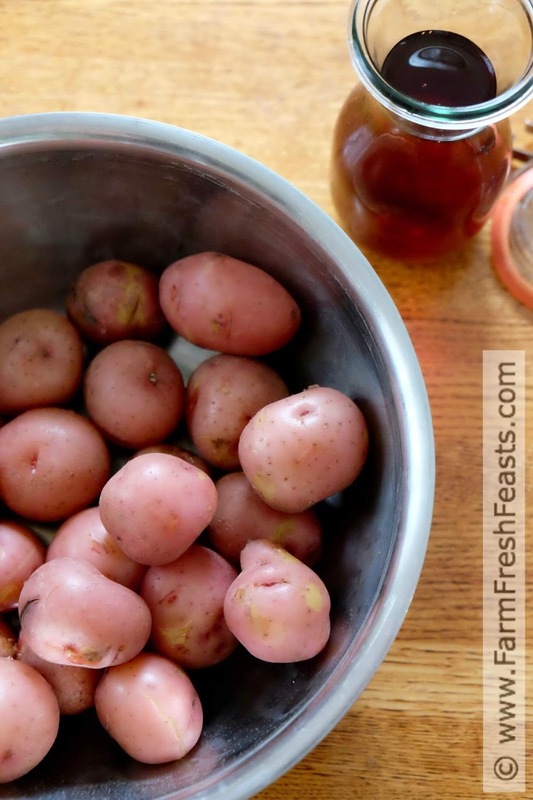 Pour chive blossom vinegar over top stir gently, and let it soak in while the potatoes cool a bit. In a large bowl, stir together the mayonnaise and seasonings. Toss in the carrots and parsley until coated, then toss the slightly warm potatoes in with the dressing. Serve right away, or chill and serve cold.